Whether it's sounds or smells, attitudes or actions, there are bound to be a few things about your colleagues you find annoying. When you’re confined to the same space for up to eight hours a day, five days a week, you’re likely to notice things about people that their closest friends and relatives might not even know. However, while some quirks might be manageable in small doses, if you’re exposed to the same bad habits day after day, month after month, year after year, it can turn a job you love into one you hate. Up to one in three employees could be quitting jobs because of frustrations with co-workers. 43% of women and 32% of men surveyed in the US by comparably.com wanted to leave their jobs because of a colleague. Rates vary according to education level, with 47% of people with doctoral degrees saying a co-worker annoyed them enough to make them want to quit compared to 26% among people without a degree. In Britain, offensive body odours, ignoring emails, and failing to wash up are the most common crimes against co-workers. In a survey by vapourcore.com, 43% of workers cited poor personal hygiene as the biggest no-no from people they share an office with. 31% of people were most annoyed by colleagues not responding to emails, while 30% of workers were most annoyed by colleagues failing to wash up after themselves. Workers in Britain spend more time in the office than anywhere else in Europe, with EU figures showing Brits work an average of 42 hours and 18 minutes a week. Germany is the only other major economy in Europe where people work longer than 40 hours a week, although only just, with Germans working an average week of 40 hours 24 minutes. 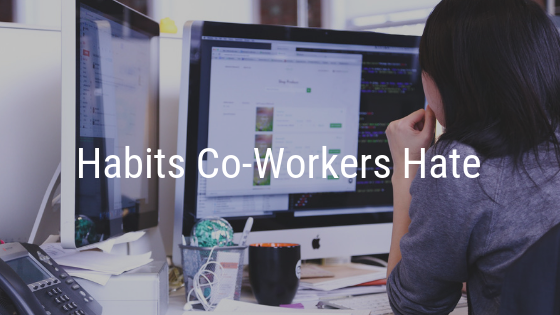 With over 40 hours a week to enjoy (or endure) your colleagues’ company, the scope for finding habits annoying is limitless. Messy desks scored 26% on the irritant league, interrupting when people speak annoyed 21% of workers, while spending too long in the loo was the top gripe for 20% - possibly those who were next in line. If you’ve ever sat next to a colleague who talks too loudly on the phone, 18% of workers share your woe. 15% of workers endure someone who smells of cigarettes, 12% someone who cooks smelly food, and 10% get fed up because someone who doesn’t change their clothes often enough. Shelley Kendrick, Managing Director, Kendrick Rose, said: “When you’re working long hours alongside people small issues can become big problems. While most people wouldn’t admit leaving a job because they found their colleagues annoying, these things all contribute to overall job satisfaction and can lead to people wanting to move on. “While it can be hard to address personal issues such as how someone smells or dresses, companies can alleviate other issues, such as staff not washing up, or having messy desks, by enforcing a clean kitchen or a clean desk policy. Other annoying habits can be headed off by creating an office environment where talking loudly on the phone, or not dressing smartly are unacceptable. New employees usually want to fit into an office and take their cue from managers, so if managers set a good example, others are likely to follow. If you’re at the point where you can endure your colleagues’ habits no longer, check out the latest positions with Kendrick Rose, or pop in for a chat about new opportunities in Jersey.